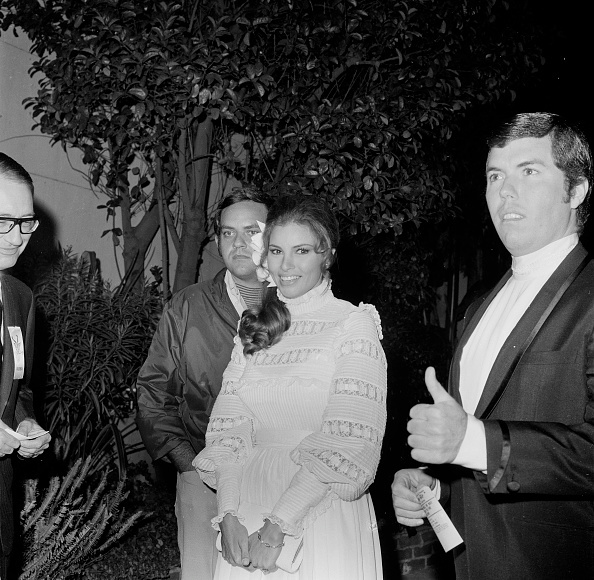 Even rain can’t lessen Raquel Welch’s star power at the Academy Awards on April 8, 1975. Bow down to Jerry Hall in Thierry Muglar at the 1st Annual VH1 Fashion and Music Awards at New York State Armory on December 3, 1995. 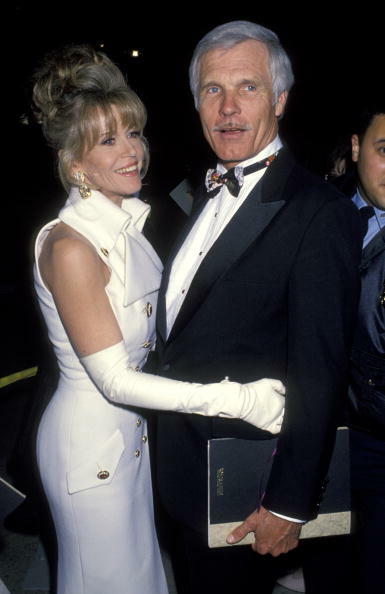 Jane Fonda in the best of the early nineties—a sleeveless white double-breasted suit with large gold buttons and matching white opera gloves—at the Academy Awards on March 29, 1993. Versace Couture seashells and red lacquer lips make Kelly LeBrock (with husband Steven Seagal) the star of the National Hero Awards Gala Benefit Big Brothers and Big Sisters on October 26, 1992 at the Waldorf Astoria Hotel in New York. Joan Collins and Elizabeth Taylor were a symphony of sparkling beadwork at the premiere of Comfort & Joy in 1984. Twiggy killing in in a crimped hair, a headband and a slinky teal dress at the 37th Annual Tony Awards in New York, on June 5, 1983. A proto-Jessica Rabbit in skintight red beading, Barbi Benton attending the 11th Annual Alan King And Caesars Palace Tennis Classic Pro-Celebrity Party And Draw at Caesar's Palace in Las Vegas on April 23, 1982. Wearing a Giorgio di Sant’Angelo ribbon dress, Kim Hunter was a rainbow foil for Vincent Price when they presented the award for “Best Makeup” at the 54th Academy Awards on March 29, 1982. 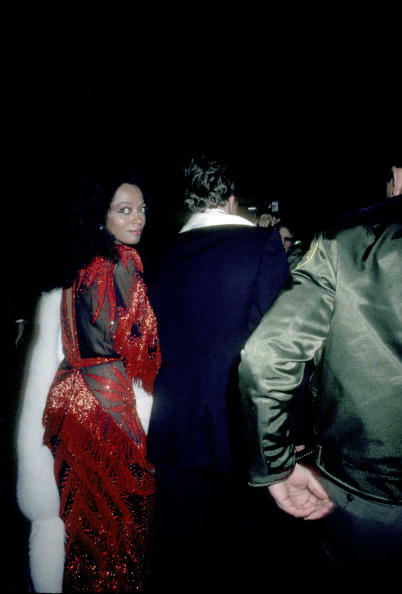 Cascades of red beaded fringe prove Diana Ross is just as glamorous leaving—at the 54th Annual Academy Awards at Dorothy Chandler Pavillion in Los Angeles on March 29, 1982. 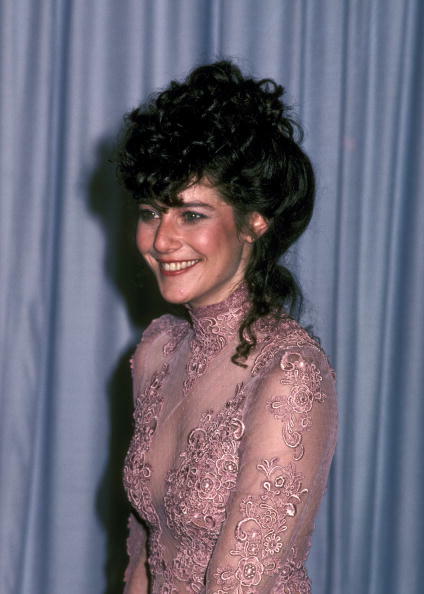 With a sheer bodice of dusky rose lace and flushed cheeks, Debra Winger was at her prettiest at the 54th Annual Academy Awards on March 29, 1982. 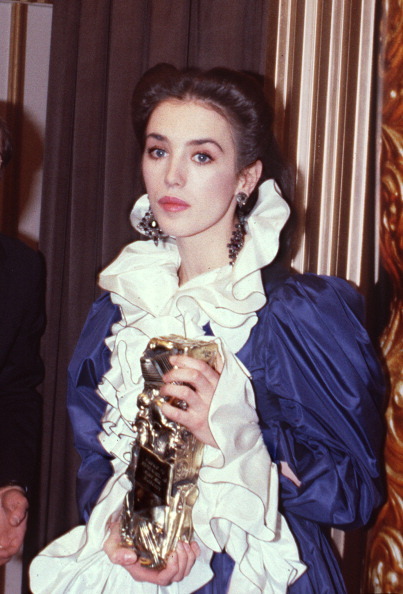 Isabelle Adjani poses in a cloud of silk ruffles with her Cesar award on February 27, 1982 in Paris. Ruffled YSL and diamonds on Margaux Hemingway for a Gala Dinner In Honour Of Luchino Visconti in Paris, November 1980. Wearing a beaded Halston dress and jacket, Margaux Hemingway parties at the Met Ball, 'Fashions of the Hapsberg Era', on December 3, 1979. Delicately pretty in organza ruffles, Nastassja Kinski attend a premiere at the Cannes Film Festival with Roman Polanski on May 19, 1979. Marisa Berenson attending the Sixth Annual American Film Institute Lifetime Achievement Awards Honoring Henry Fonda on March 1, 1978 at the Beverly Hilton Hotel with heavily piled ethnic jewellery and a mink. With a fully beaded dress and a veil over her face, Diana Ross attends the Motion Picture Pioneer of the Year Awards dinner honoring Dr. Jules Stein at the Waldorf Astoria Hotel in 1978. Proving why she is still considered one of the sexiest women ever, Raquel Welch presenting an award alongside Kirk Douglas while wearing a plunging, red lurex draped dress at the 50th Academy Awards on April 3, 1978. Farrah Fawcett looking flawless in a Stephen Burrows gold chainmail dress at the 50th Academy Awards on April 3, 1978. Cher + Bob Mackie = A match made in sparkling heaven. At the opening of Filmex at the LA Film Festival in March 1977. 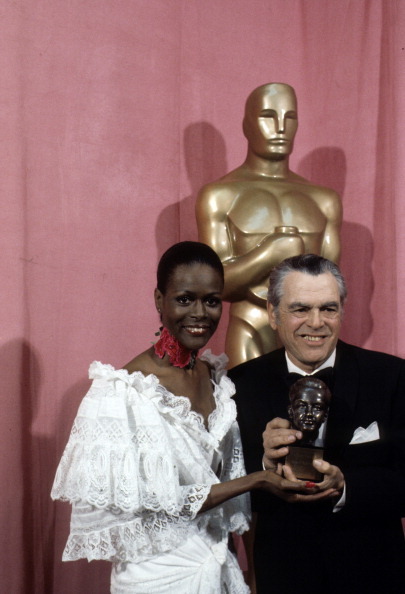 In a riot of white lace with a red flower choker, Cicely Tyson presenting Pandro Berman with his Irving G. Thalberg Memorial Award at the 49th Annual Academy Awards, on March 28, 1977. Ann Margret in witchy lace backstage at the 49th Annual Academy Awards, on March 28, 1977. Raquel Welch trying on a Loris Azzaro sequined jumpsuit in his Paris atelier; she wore it to present the Academy Award for “Best Original Score” in 1977. In a simple navy silk dress with feather trim, Angie Dickinson arrives with husband Burt Bacharach to the American Film Institute Salute to William Wyler on March 9, 1976. Wearing a vintage 1930s dress, Charlotte Rampling looks stunning backstage at the 1976 Academy Awards with Anthony Hopkins. Bob Mackie always made the best sequined dresses—and this one on Angie Dickinson is no exception. 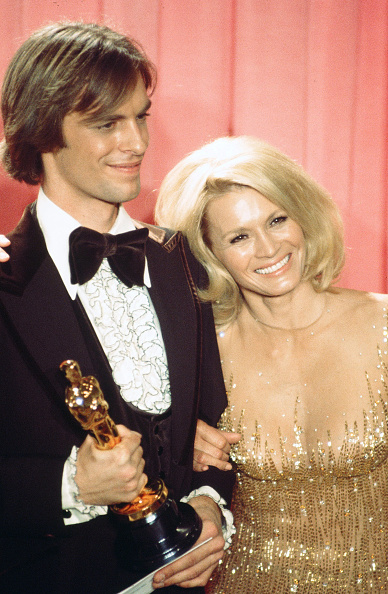 With Keith Carradine backstage at the 48th Academy Awards on March 29, 1976. Marisa Berenson (in a cut-out bodice) and Marlo Thomas (in a jersey wrap) are effortlessly cool with Barry Diller and David Geffen at the Hollywood premiere of Barry Lyndon, in December 1975. In a sheer star-embellished dress, Monique Van Vooren attends the premiere party for the Broadway show 'Man on the Moon' with the show’s producer, Andy Warhol, in January 1975. An explosion of sparkles and satin with Cher, Elton John and Diana Ross backstage at the 1975 Rock Music Awards. So clearly shown in the two previous images, the glamour of Raquel Welch and the chic of Glenda Jackson seated next to each other at the Academy Awards on April 8, 1975. Completely disregarding normal conventions of Hollywood glamour, Glenda Jackson looks chic and effortless in Jean Muir at the 1975 Academy Awards. 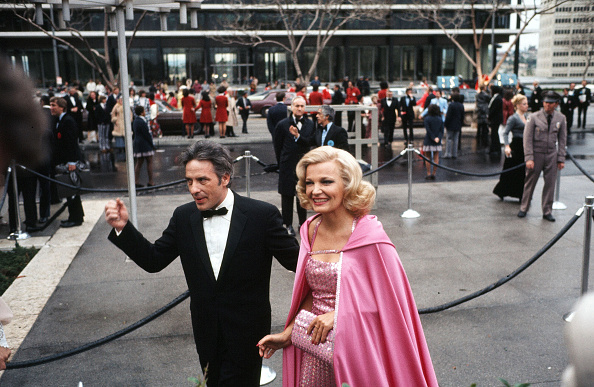 In the ultimate Barbie outfit, Gena Rowlands arrives with her husband John Cassavetes to the 47th Academy Awards in 1975. Wearing candy-colored Halston, Lauren Hutton walks into the Dorothy Chandler Pavilion for the 47th Academy Awards on the arm of Lou Adler. Anjelica Huston, in a Halston fishscale sequin dress, with boyfriend Jack Nicholson arriving at the 47th Annual Academy Awards on April 8, 1975. Immaculate waves, plunging peach and tawny skin on Raquel Welch for the 46th Annual Academy Awards in April 1974. Diana Ross, in red ostrich trimmed cape, accepting an award from Henry Mancini at the American Music Awards on February 19, 1974. Only Cher could make a tropical Bob Mackie bandeau top and sarong skirt (complete with iridescent flowers around her neck and on her head) look appropriate for the Academy Awards in 1974. What is hotter than black leather opera gloves? Raquel Welch wearing them with a slinky, strapless dress to the Academy Awards in March 1973. Dyan Cannon rocking a studded white maxi-skirt suit appliqued with a psychedelic velvet design to the 45th Annual Academy Awards on March 27, 1973. Arriving in a white satin three-piece suit, Diana Ross enters the 45th annual Academy Awards ceremony on March 27, 1973. Accompanied by the hottest quarterback ever (Joe Namath), Raquel Welch wears a flower-print slip dress with matching wrap jacket to the Academy Awards on April 10, 1972. Wearing a simple 20s inspired beaded top and satin skirt, Michelle Phillips accompanies boyfriend Jack Nicholson to the 43rd Annual Academy Awards on April 15, 1971. In the dreamiest Bill Gibb gown and velvet cape, Twiggy attends the London premiere of her first starring film, The Boyfriend, with her manager/boyfriend Justin de Villeneuve at the first night of The Boyfriend in 1971. 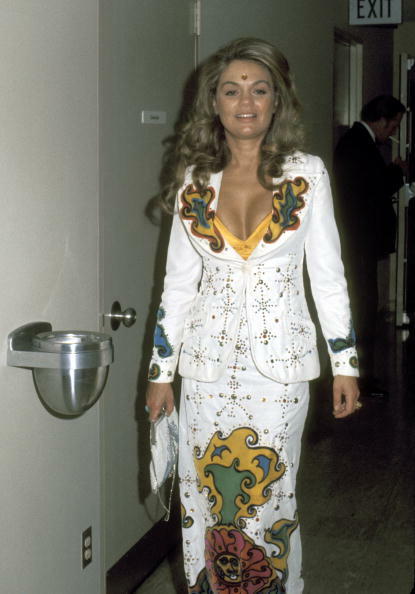 Angie Dickinson in a white bare midriff dress by Bob Mackie at an event in New York in 1970; she also wore this dress to the Academy Awards. John Wayne with his sparkling lavender wife, Pilar, and daughter at the Academy Awards after winning the best actor Oscar for True Grit on April 7, 1970 in Los Angeles. Elizabeth Taylor—all cleavage and major diamonds—conversing with husband Richard Burton at the 42nd Annual Academy Award on April 7, 1970, while a YSL-clad Veronique Peck looks on. In a simple black turtleneck dress and an Assuit shawl, Jane Fonda is a classic beauty with then-husband Roger Vadim at the 42nd Annual Academy Award on April 7, 1970. 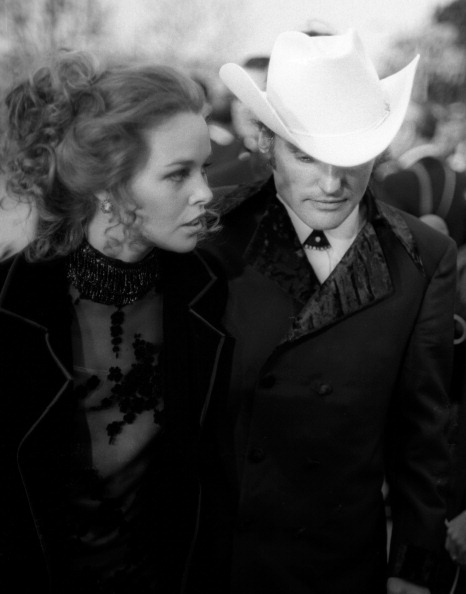 Michelle Phillips—with Gibson Girl curls, a sheer lace bodice and velvet jacket— arriving with Dennis Hopper at the 42nd Annual Academy Awards on April 7, 1970 in Los Angeles. Presenting the “Best Director” award at the 41st Annual Academy Awards on April 14, 1969, Natalie Wood, Ingrid Bergman, Jane Fonda, Diahann Carroll and Rosalind Russell prove the importance of personal style. Psychedelic floral silk appliqued on to white organza makes Natalie Wood the belle of the New York Film Festival opening night on September 16, 1969. 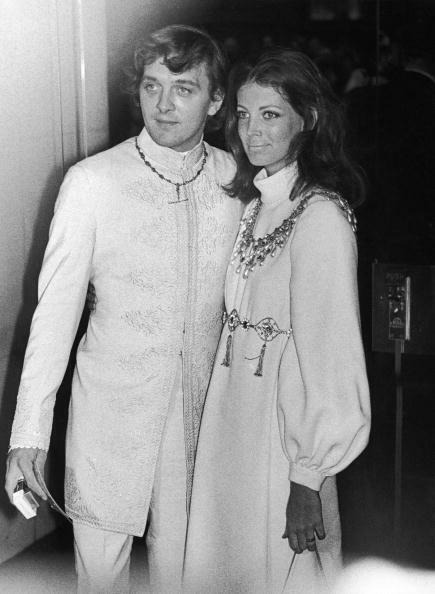 A dreamy couple all in white, David Hemmings and Gayle Hunnicutt at the premiere of Oh! What A Lovely War in London, 10th April 1969. Layering a body chain over a psychedelic print dress, Raquel Welch attends the Academy Awards in Los Angeles on April 14, 1969. 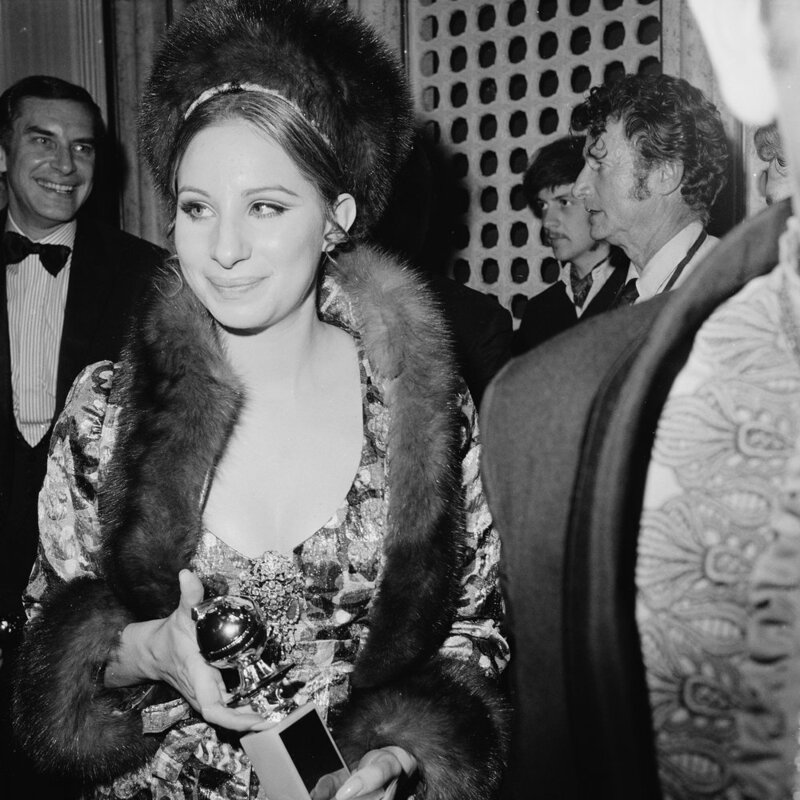 Barbra Streisand—all shimmering brocade and fur—carrying her award for “Best Performance by an Actress in a Motion Picture – Comedy or Musical” during the 26th Annual Golden Globe Awards on February 28, 1969. Wearing a heavily beaded white gown with a white fox fur coat, Shirlee Fonda accompanies her husband Henry to the New York premiere of his film, The Lion in Winter, on October 30, 1968. In a simple black shift and perfect blond hair, Linda Evans attends the Emmy Awards with husband John Derek, May 1968. Warren Beatty accompanies feather-clad Faye Dunaway to the Golden Globe Awards in 1968. Sisters Catherine Deneuve (in white lace and ruffles) and Françoise Dorléac (in slinky lurex) at the premiere of Les Demoiselles de Rochefort in Paris on March 7, 1967. In a high-necked white dress and flower behind her ear, Raquel Welch looks girlish and romantic while attending an event in LA with husband Patrick Curtis in 1967. A deep plunge—major hair—fox trim. Perfect Ursula Andress arriving at the London premiere of The Blue Max, on July 1, 1966. Goddesses Julie Christie, Ursula Andress and Catherine Deneuve showing how it is done at a Royal Film Performance of Born Free in London on 14th March 1966. 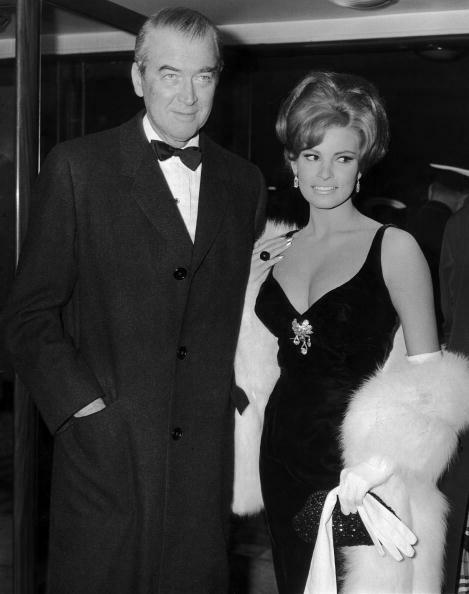 The combination of black with a large jeweled brooch is equally fantastic on Raquel Welch while attending the premiere of The Flight Of The Phoenix with James Stewart in London on January 20, 1966. Jean Shrimpton, clad in a simple black dress amped up by lots of lashes and a large brooch, accompanies then-boyfriend Terence Stamp to a London premiere on October 14, 1965. With a beehive and fully sequined strapless gown, Claudia Cardinale attends the Academy Awards with Rock Hudson on April 7, 1965. In Paris for a premiere on December 2, 1964, Elizabeth Taylor wears a gold sari by Balenciaga with an elaborate hairstyle by Alexandre. 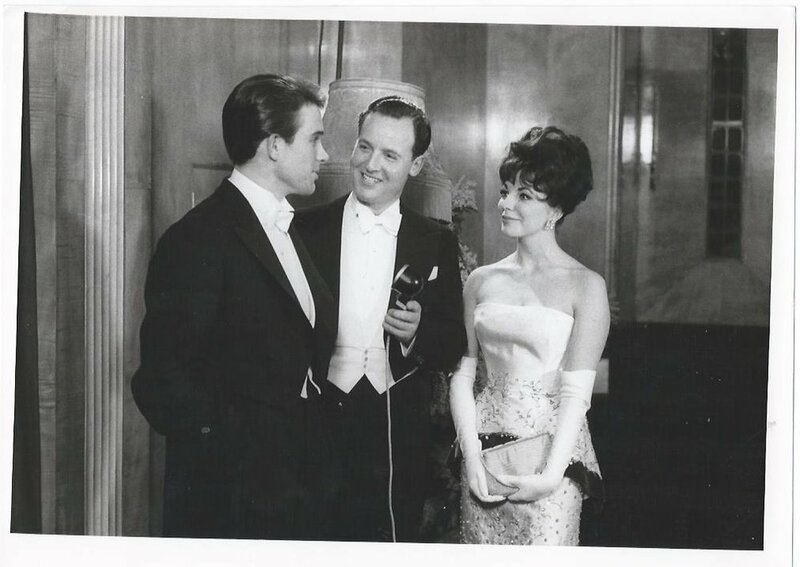 Joan Collins, in an embroidered white column and opera gloves, chatting with Nicholas Parsons and boyfriend Warren Beatty at the London premiere of The Roman Spring of Mrs Stone in 1961. In skintight lace, Jayne Mansfield accepting her Golden Globe award from actor Mickey Rooney for 'New Star Of The Year' in Los Angeles on February 22, 1958. Frank Sinatra getting close to the immaculate Sophia Loren at the Hollywood premiere of The Pride And The Passion on June 26, 1957. Wearing one of the scandalously low-backed dresses she was infamous for, Vikki Dougan attending the premier of Heaven Knows, Mr. Allison in Los Angeles, March 15th, 1957. The day before she left for Monaco, Grace Kelly wore a white embroidered gown and satin capelet to the 28th annual Academy Award on March 21, 1956. 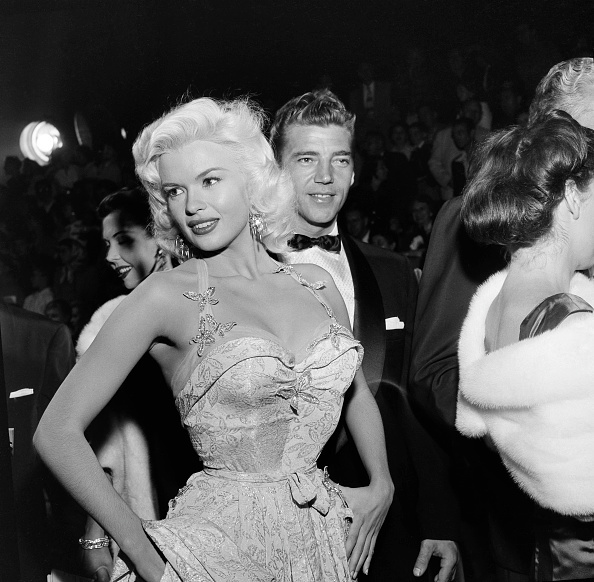 Brocaded lame, beaded butterflies and a killer body made Jayne Mansfield (with husband Mickey Hargitay) the star of the Giant premiere in Los Angeles, October 17, 1956. Ava Gardner also wore a Norman Norell sequin ‘Mermaid’ dress to a premiere in 1954. Glamour girls Sara Shane and Mamie Van Doren attending the premiere of The Glenn Miller Story in Los Angeles, December 10, 1953. Wearing a Norman Norell sequin ‘Mermaid’ dress, Lauren Bacall sparkles next to Humphrey Bogart and Marilyn Monroe at the premiere of How To Marry A Millionaire on November 4, 1953 in Los Angeles. 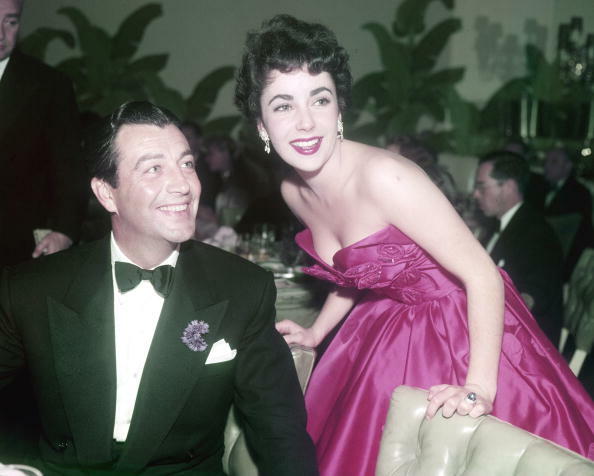 In strapless magenta satin, Elizabeth Taylor talks with Robert at the premiere after-party for Quo Vadis in Los Angeles on 29th November 1951. 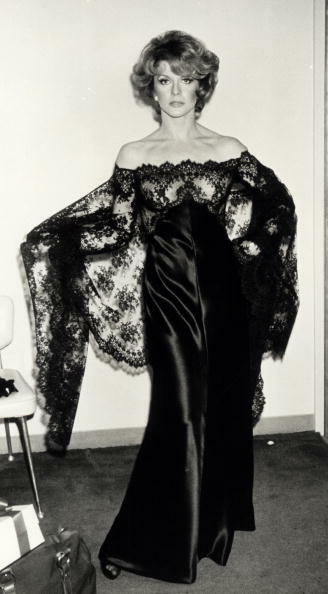 Leslie Caron, in a strapless taffeta dress and fur stole, at the premiere of An American in Paris in Los Angeles. Frank Sinatra escorts a lace clad Ava Gardner to the Show Boat premiere in Hollywood, September 18, 1951. In an exquisite off-the-shoulder striped gown, Loretta Young chats with Princess Margaret at the premiere of The Bishop's Wife, 1947. 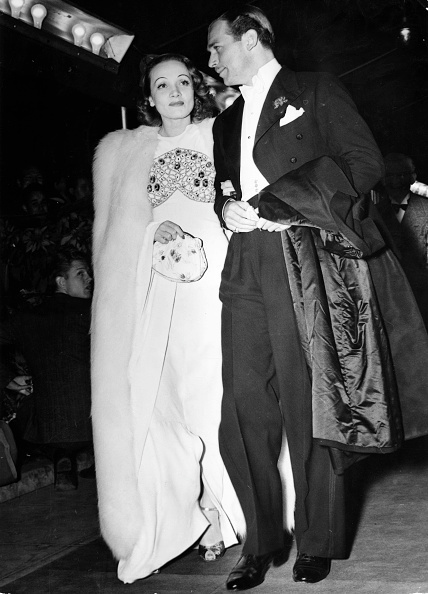 Joan Crawford, in a heavily embroidered jacket and turban, accompanied by Charles Martin to the premiere of The Old Maid at the Beverly Hills Theater on July 30, 1939. Marlene Dietrich, in white crêpe and fox, arriving at a film premiere with Douglas Fairbanks Jr. in Hollywood, 1937. 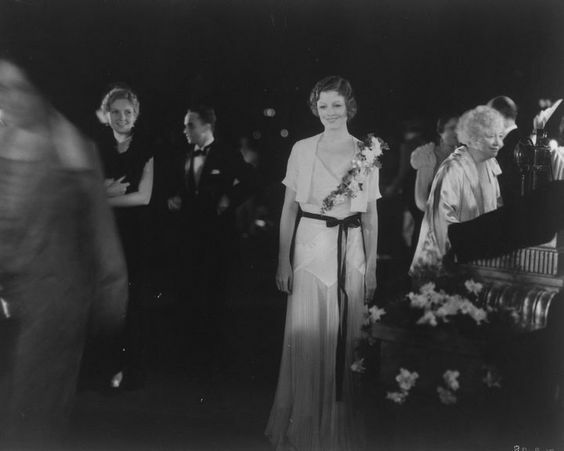 Myrna Loy in a bias cut chiffon dress at a premiere at Carthay Circle Theater in Los Angeles, 1935. Since the mid-1990s—when fashion houses began to realize the branding and marketing opportunities of dressing celebrities for the red carpet—there has been a steady decline in true personality and uniqueness at award ceremonies and premieres. Even in the studio era, when every aspect of an actress’ aesthetic was carefully orchestrated by a team of costume designers and Svengalis, it was generally accepted that each actress had her own identity and characteristics (however cultivated and disparate from her own). Following the break-up of the studio system, actresses chose and purchased their own clothes for events. While some became friends with designers who helped them, for the most part they were on their own. Through their choices their personalities were able to come to the fore—revealing through their enjoyment or rejection of glamour much more about themselves then immediately obvious. Every year I tune in to all of the awards shows, hoping to see a quirk—an ounce—of uniqueness, of playfulness, of personality. Instead it seems as though the fear of getting on the worst dressed list has bred several generations of actresses that are too safe. The gowns are interchangeable, the hairstyles boring, the faces overly done. In honor of the Golden Globes this weekend, this slideshow is a celebration of how it used to be—over-the-top glamour, overwrought ruffles, piled on makeup, as well as slouchy coolness and minimal shifts. Taken from over 60 years of premieres and award shows, this is where the red carpet equals joy (and a lot of Raquel Welch).